Properties in West Atlanta are unique and historical. Most residents consider the area part of the suburbs, although it is less than one mile from Centennial Olympic Park. West Atlanta includes the West End and the Atlanta University Center Consortium (AUC Consortium) to the north. The real estate market is growing in this area due to the construction of the Beltline, a biking and walking trail with natural greenspace that connects many Atlanta neighborhoods. West Atlanta is well-known for its historical architecture, including craftsman historic houses and Victorian-style homes. It is also not uncommon to find older ranch homes and new apartment complexes that do not encompass this historical architecture. 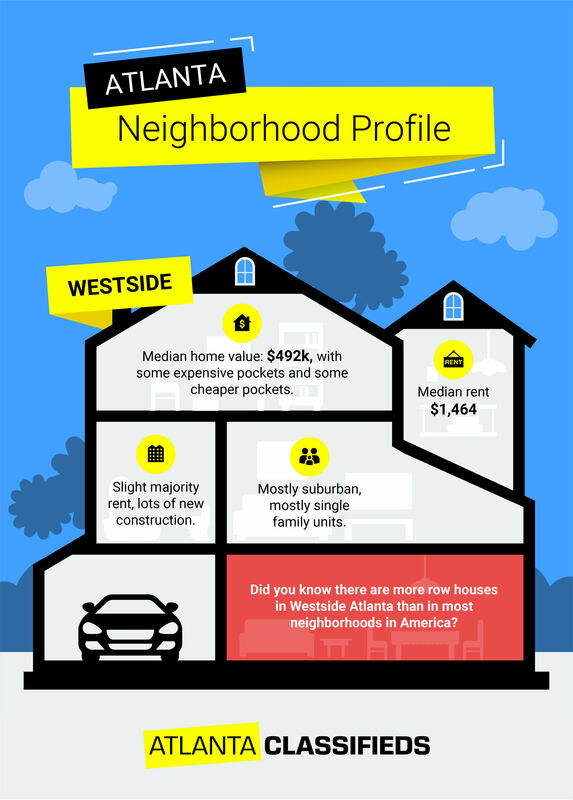 The median sales price for properties in West Atlanta is $275,000. Home sale prices have shown a gradual increase over the past five years and continue to rise. Cascade Heights is a West Atlanta neighborhood known for mansion homes that are owned by affluent residents. This southwestern neighborhood is home to famous Atlanta residents, including Hank Aaron and national political figures. Additional neighborhoods to note in the area include Castleberry Hill, Westview and Adair Park. Tips for renting an apartment or buying a home in West Atlanta, GA. The area includes a mixture of suburban neighborhood communities and apartment complexes. The median rent for an apartment in West Atlanta is $1,467 per month. 1 bedroom apartments generally rent for $500 per month while 3 bedroom rentals come in at around $1,495 per month. Cheap rental properties are popular with residents in West Atlanta and complexes are often occupied by college students who attend school at the Atlantic University Center (AUC). Students who do not find rentals within on-campus housing usually live in local West Atlanta apartments or other available rental properties in the area. West End encompasses 27,988 residents while the AUC area houses 22,069 residents, with a median age of 27. The cultures and ethnicities are diverse in the area, but most residents are African American. Additionally, most residents have earned bachelors’ degrees, associates’ degrees or are currently attending college. Residents living in the perimeter of West Atlanta have numerous restaurant options to enjoy and many include vegan and vegetarian options. Tassili’s Raw Reality Café in the West End offers raw and vegan options, including wraps and desserts. The Soul Vegetarian is also in the West End and provides a Southern menu free from meat. The Busy Bee Café is located in the AUC and is a quick place to grab Southern soul food on a budget. Residents who want to venture into other parts of the city can make their way to the West End Transit Station. The Metropolitan Atlanta Rapid Transit Authority (MARTA) is a train that picks up passengers from this station and allows them access to several transit lines throughout the city. Residents can also drive their own cars, hire taxicabs or use ride-sharing applications for transportation to other parts of Atlanta. The Beltline starts on White Street in West Atlanta and is often referred to as the Westside Trail in this area. Residents can use the trail to walk or bike throughout the city. The Beltline runs from the north in Adair Park to Lena Avenue at Washington Park and also includes some street car operation. The suburbs are not usually known for walkability but West Atlanta includes many residential properties close enough to restaurants and shops that most residents do not need transportation to enjoy the area. History is a big part of the entertainment options available in West Atlanta. The Wren’s Nest is the former home of Joel Chandler Harris who wrote “Brer Rabbit.” The home is now open for public tours. Hammond’s House Museum is also open for public tours and includes historic African American art. Residents and tourists can tour both properties and learn more about the history and culture of Atlanta. The Mall West End is a shopping mall that includes a variety of stores that offer clothing, shoes, accessories, home goods, furniture and bath products. Girl Crush by C John is a local women’s store specializing in fitness wear, clothing and gowns in the West End area. The MARTA can easily take residents and guests to all shopping areas in West Atlanta if they prefer not to walk. Since many college students call West Atlanta home, there is also nightlife available in the area. Rain Nightclub near Adair Park is open late and features dancing and hookah service. The Museum Bar is a club located in a former Baptist church that offers food, drinks and music. The Painted Duck is close to the AUC and offers bowling, games and a full-service bar.